According to a report from Taipei-based Digitimes, both Samsung and Taiwan Semiconductor Manufacturing Company (TSMC) will make future Apple processors. Samsung, which has been manufacturing Apple A series processors to date, will continue to make the chips up to at least 2015, according the report in Wednesday's Digitimes. TSMC, meanwhile, is slated to participate in production of Apple's 2014 iPhone. A CNET source, however, has said that TSMC is already manufacturing Apple A series processors and has got hold of a portion of the 14/16 nanometre chip orders from the vendor. It isn't clear, though, whether that production is at a commercial level or at smaller pilot-prototype levels. Apple has been seeking to reduce its reliance on Samsung as the two companies have become fierce rivals in the mobile marketplace and in the courtroom. They have continued to work together in several areas, though, particularly in the component market where Samsung is the leader in technology, capacity and pricing. 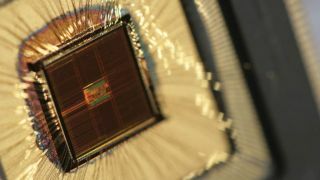 TSMC's planned 16 nanometre processor will use FinFET vertical transistors, which are comparable to Intel's 3D transistor technology. This would get the A series processors closer to the those made by Intel, currently the world leader in chip manufacturing. Apple's new A7 chip already boasts 64-bit processing, closing the gap between the two companies. Chip production is usually fiercely guarded by both manufacturer and customer, so details at this stage are by no means definitive. On top of this, production problems have hampered TSMC before when they were rumoured to be working on Apple chips. The two companies were also rumoured to have been in disagreement over the production process. TSMC are said to land 60-70% of Apple's total for 14/16 nanometre orders while Samsung takes over the remaining 30-40%. Could we be soon be seeing Samsung stores on the high street?